"I received our magnet order yesterday and I couldn't be happier. You were such a big help getting this project done for us in such a short amount of time, the quality of the product is excellent, and we received it EARLY!" Magnetic business cards act like mini billboards in homes and offices, keeping you on people's minds long after your first interaction. We make magnetic cards by printing your business card design on a sheet of magnet stock which we then cut into individual cards. Standard cards are rectangular, but we can also die cut them to create rounded corners or shapes that give your magnets a distinct personality to tie in with your brand. Magnetic cards make great promotional items because they tend to stick around longer - and more visibly - than ordinary business cards. People put them on refrigerators, file cabinets and memo boards, where they'll likely be seen by more than one person every day. Magnetic cards are a clever way to get your brand or product seen and remembered. Here are some design tips to get the most out of them. Magnetic cards tend to be read from a distance, so keep the text bold and easy to see. For better readability, make sure there's a high level of contrast between the text and the background. Use bold graphics and complementary colors to make the design visually appealing. 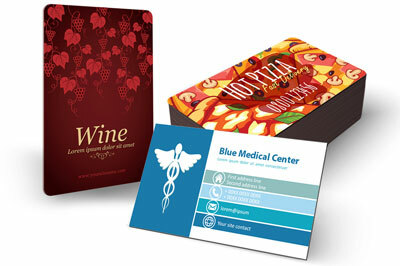 An attractive card is more likely to end up in a prominent spot. We offer three thicknesses of magnet stock, so you can choose the one that gives your magnet the "right" feel. With businesses increasingly focused on websites and social media, business cards can feel old-fashioned. But unlike a website, a magnetic business card is always visible. It's a tangible and useful way to keep people thinking about your business. A tagline that explains what your business does, if it's not obvious from your name. Your phone number and website URL. Your address and hours of operation, if people might need to visit your physical location. Magnetic business cards are ideal for service businesses whose number people need in an emergency, like plumbers, mechanics and veterinarians. 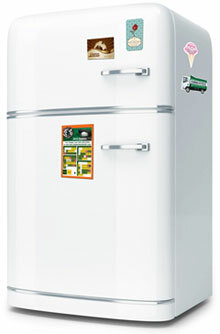 People stick the magnet on the fridge and when there's a problem, you're the one they call. A magnetic card for a takeout restaurant makes it easy for people to phone you when they need a meal to go. Or a tourist attraction can give away souvenir magnets that remind visitors of their wonderful trip and promote the destination to the folks back home. Magnetic business cards make effective calendars and "save the date" reminders for weddings, concerts, festivals and other special events. Use them for sports team calendars, or to remind people when they're due for another service call. 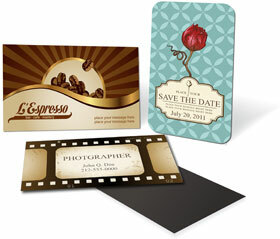 To increase the chance that your magnetic business card will wind up on permanent display, combine it with die cutting. Our standard dies include a house, circle, oval, bandage and telephone, but we can also create custom shapes. Use die cut magnets to suggest your products or service. Think of a magnet shaped like a Chinese takeout container, a garbage truck or a toothbrush. Or put a punch-out hole in the middle of the card, turning it into a perfect frame for the kids' school photos and a mini-magnet to display someplace else - that's twice the impact from just one card. Business cards are a versatile way to get your company's message across. Magnetize yours and you'll attract more business than ever. Have questions about printing magnetic business cards?